Microsoft has shuttered its ebook bookstore, yet another move by the company away from selling traditional consumer goods and services, with the exception of its Xbox console. 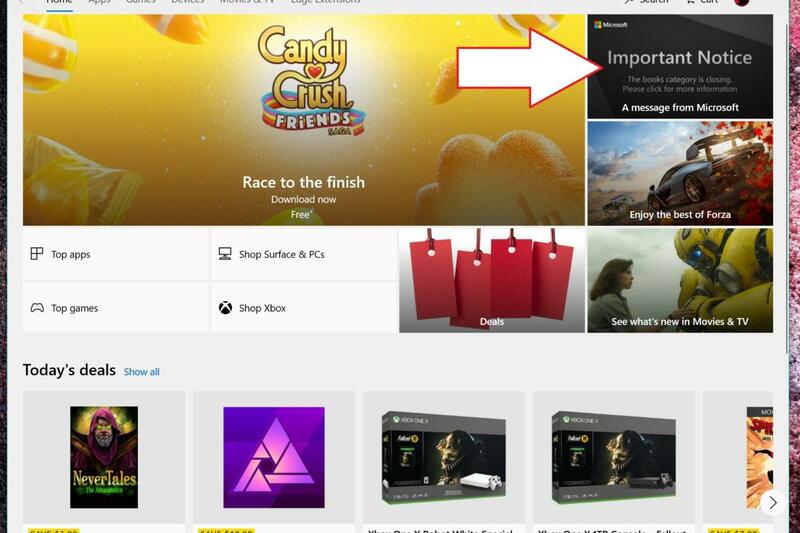 Microsoft made its decision without fanfare on Tuesday, simply posting a notice in the corner of the Microsoft Store app and removing the “Books” tab. Microsoft’s notice now leads to a support page and FAQ where Microsoft posted the answers to the questions consumers want to know: namely, what will happen to my books? The answer, simply put, is that they’ll disappear entirely sometime around July 2019, and you’ll be given a full refund. If you ordered or rented an ebook before today, your order will be cancelled and refunded. Free ebooks downloaded via the Microsoft Store app will also disappear, and they won’t be available after July, either. Microsoft didn’t say why it was discontinuing its ebookstore, though lack of demand was probably a factor. Microsoft promoted its Books tab simply through the Store app, without any overt marketing of its contents or any deals within—unfortunately, a somewhat typical Microsoft failing. The ebookstore also had two likely-fatal flaws: ebooks purchased within the Books tab weren’t downloadable, and they were readable only within the Microsoft Edge browser, which has a meager 4.4-percent share of the browser market. Microsoft’s ebooks experience began bumpily, without the bookmarks and annotations you’d expect. Unfortunately, even though those capabilities arrived later—along with some nifty PDF capabilities—it’s possible that customers had moved on. After all, Microsoft’s ebook competitor was Amazon, whose mammoth online bookstore already boasted tons of titles that could be downloaded and read within Amazon’s full-featured Kindle app. Microsoft didn’t say exactly when in July the ebooks would disappear, implying that it will occur on an individual basis. “Your books will be removed from Microsoft Edge when Microsoft processes the refunds,” Microsoft said. What this means for you: For anyone who’s watched Microsoft continue to turn away from the consumer market, most recently killing its Groove music service in 2017, the shuttering of its meager ebook service isn’t surprising—but it is disappointing. At least Microsoft’s Movies & TV tab within the Microsoft Store app appears to be alive and well, with lists of frequently rented movies and TV shows, and, more importantly, sales and discounts. Which New ‘Reality’ Reigns Supreme? 'Spaceplane' that flies 25 times faster than the 2019-04-08 08:42:40A 'spaceplane' that flies 25 times faster than the speed of sound has successfully passed a crucial testing milestone. Cybercriminals still using Facebook as a black market 2019-04-08 08:22:00Want to buy stolen credit card numbers? Watch Tesla Model 3 Performance complete a lap 2019-04-09 06:17:42 For the first time, as far as we know, a Tesla Model 3 Performance completed a lap at the Nürburgring race track and you can watch it on video.